As a "community" health care facility, Burnett Medical Center has positioned itself to be responsive to our patients' needs not only within our walls, but out in the community. In partnership with Burnett County DHHS-Public Health and the St. Croix Tribal Health Clinic we conducted Community Health Needs Assessments (CHNA) in 2013 and 2016. Required by the Patient Protection and Affordable Care Act to be conducted every three years, the goal of the assessments are to identify the most significant health needs among Burnett County residents and develop a plan to address the identified health needs. When the Health Needs Assessments revealed opportunities for improving Burnett County's health status, we took a lead role in these efforts. 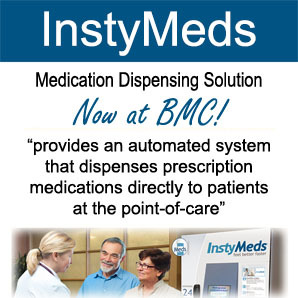 More significant than simply meeting a requirement, this continual process and partnership creates an infrastructure for continual health improvement. 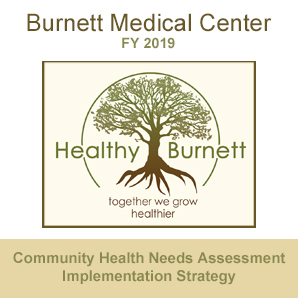 Community Health Needs Assessments Leads to "Healthy Burnett"
As a means to address the top need of behavioral health identified through the 2013 assessment, "Healthy Burnett" was formed. Led by Burnett Medical Center and Burnett County DHHS-Public Health, Healthy Burnett is a group that brings together key community stakeholders to align activities and resources to enhance how the community addresses identified health needs. Healthy Burnett has been meeting regularly since June 2013. Since then Healthy Burnett has developed two separate strategic action plans, one in 2013 and another in 2016, which details a community-wide response to improving Burnett County's status on the top health need that year. The 2016 strategic action plan is focusing on Alcohol and Other Drug Abuse. To help fund Healthy Burnett's efforts, Burnett Medical Center applied for and was awarded, in partnership with Burnett County DHHS-Public Health and Northwest Passage, a nearly $10,000 Healthy Communities Mini-Grant from Security Health Plan in 2014. In 2015, Burnett Dairy awarded Healthy Burnett over $2,000 to help execute programs planned for 2015. For more information about Healthy Burnett, or to become a member and join in these efforts, please visit healthyburnett.org.